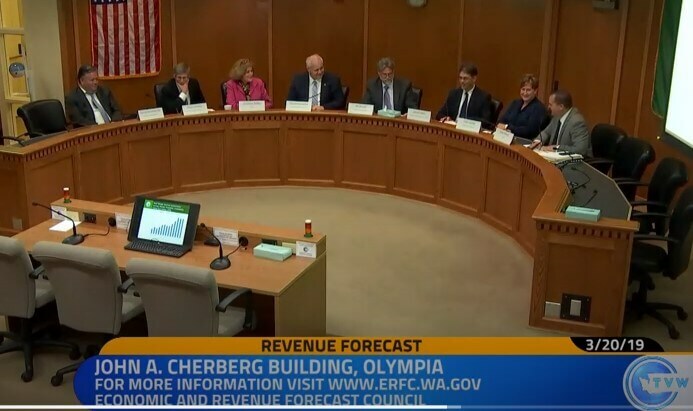 Steve Lerch, Chief Economist and Executive Director of the Economic and Revenue Forecast Council delivered the state’s first Economic and Revenue Forecast of 2019 on Wednesday, March 20th, just ahead of biennial budget season. 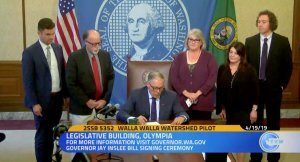 Though Lerch explained that there were not a lot of changes in the economic forecast, he highlighted Washington’s strong, but somewhat unanticipated, revenue growth. 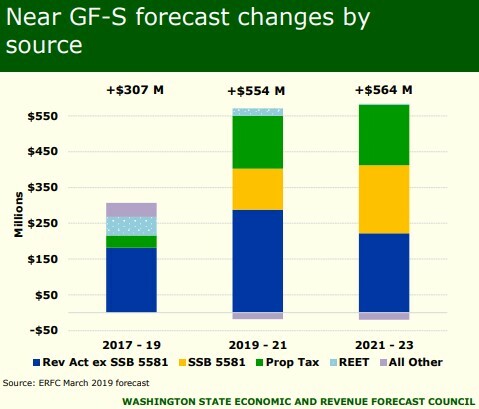 General Fund-State (GF-S) revenue collections for last quarter were $245 mil, which is 3.7 percent higher than originally forecasted in November 2018. More specifically, from February 11-March 10 GF-S collections were $91.4 million, 6.8 percent above the November forecast. The report attributes most of these increases to changes in timing of collections and one-time large payments that were not anticipated in the original forecast. However, even removing those unique collections it is 2.6 percent percent higher than forecasted. In addition to strong GF-S collections, sales, use, B&O, utility, and tobacco taxes and penalties came in strong at $41.6 million, or 3.4 percent above forecasts. Adjusted for one-time large payments and refunds, collections posted 8.1 percent year-over-year growth, suggesting that we have not yet reached the predicted eventual slow-down — at least not in Washington. 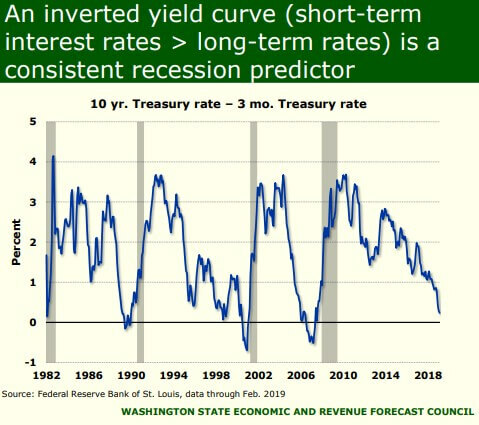 As further relief to consumers and legislators alike, Lerch pointed out that, though it is inching downward, the yield curve, a heralded precursor of recession, is not yet inverted. Most economic strength indicators appear steady, though not as stellar as some economists had hope. The report points to disappointing job growth in the state, with 4,700 fewer jobs, and slowed growth in retail sales nationally. 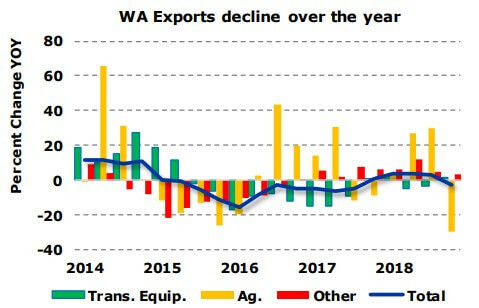 Of particular concern are a cooling housing market that showed prices falling by 0.1 percent and a 2.7-percent decline in Washington State exports, much of what can be attributed to a steep drop in agricultural exports. Economic risks to watch include the grounding of the 737 MAX by Boeing and the current and possible continuing lack of a US/China trade agreement. 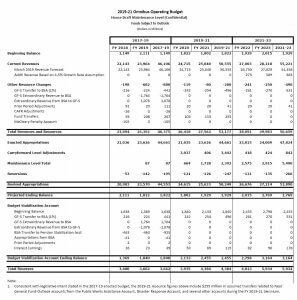 However, based on the strong revenue numbers, the Council revised its revenue forecast upward by $307 million for the 2017-19 biennium and $554 million for the 2019-21 biennium. 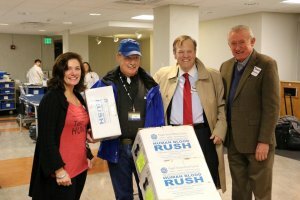 Legislators greeted the positive news with guarded optimism, potentially tipping their hands as they enter into budget talks in the weeks to come.